2 Live Oak Road in Norwalk is the most deceiving home I have listed, in the best way possible - its unexpected size and potential. Despite the word potential, it is also move-in ready, and today's buyer's perfect home. Driving up the quiet Cranbury Road approaching Cranbury Park, 2 Live Oak appears to be a regular sized single family ranch - one level living. But, once you start exploring, you realize there is so much great space, and ample room for expansion. The front of the home faces Live Oak Road, but the driveway is currently accessed from Grumman Ave. In fact, across the street from the driveway to this property is an entrance into Cranbury Park, one of Norwalk's most precious gems. Cranbury Park has undergone improvements in the last ten years that make it one of Norwalk's most enjoyable parks - nature trails, a large mansion set in the middle of the park, disc golf, pet friendly trails, and more. The Nature Preserve of the Park backs up to 2 Live Oak, accounting for the most quiet neighbor possible. Upon entering the home from the front entrance, you enter a large entryway/foyer at the center of the home. With hardwood floors throughout, you can already feel a modern essence to the home. On the right, you immediately enter the large living room, with huge, newer windows. This room has a large fireplace and mantel at the center of the room, and more than enough space for a tv to the side, or above it. Recessed lighting is present throughout the home. From here, you can see a sliding glass door to dampen the noise into the kitchen, if you want to have simultaneous activities in these rooms. Also off this kitchen and straight ahead from the front door is a large, square dining room, with sliders to the back yard. The sliders lead directly to a patio, and can overlook the woods part of Cranbury Park that is unused and will never be built upon. The dining room also has a built-in hutch, avoiding the need for unnecessary furniture. The kitchen is newly updated, and has granite counters, white cabinets, recessed lighting, and stainless steel appliances - everything you expect in a kitchen. 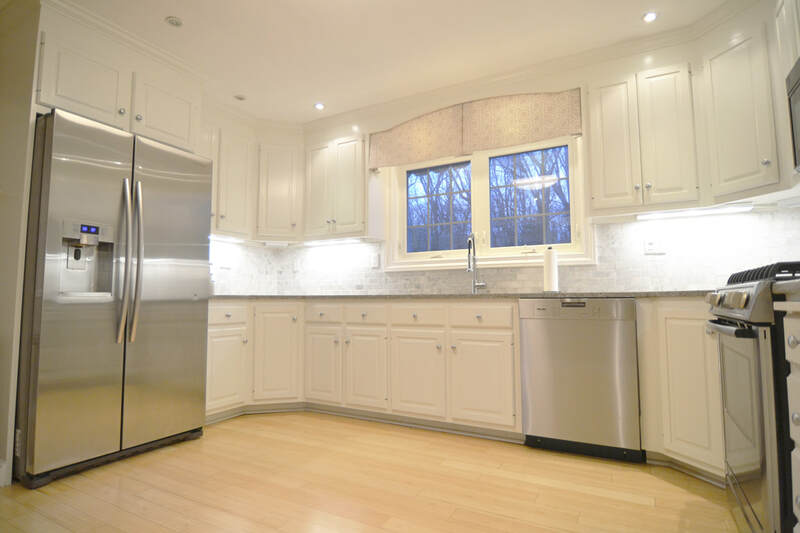 There is a white-stone backsplash, and deep stainless steel sink with any chef's dream faucet. The under-cabinet lighting helps make this kitchen bright and inviting. Through the kitchen, there is a mudroom, and a series of doors leading to several special rooms: There is a door to the laundry room, which also has a staircase up to the full attic. The next door is down to the basement, which is about 2000 square feet of ~8 foot ceilings, another full bathroom, a second stone fireplace, and the brand new heating system (<3 years), which is high-efficiency, and top-of-the-line; this basement can easily be finished and turned into anything the buyer desires. The next door is one into the garage, a 2-door bay, and another expanded space at the back that can fit another 3-4 cars. 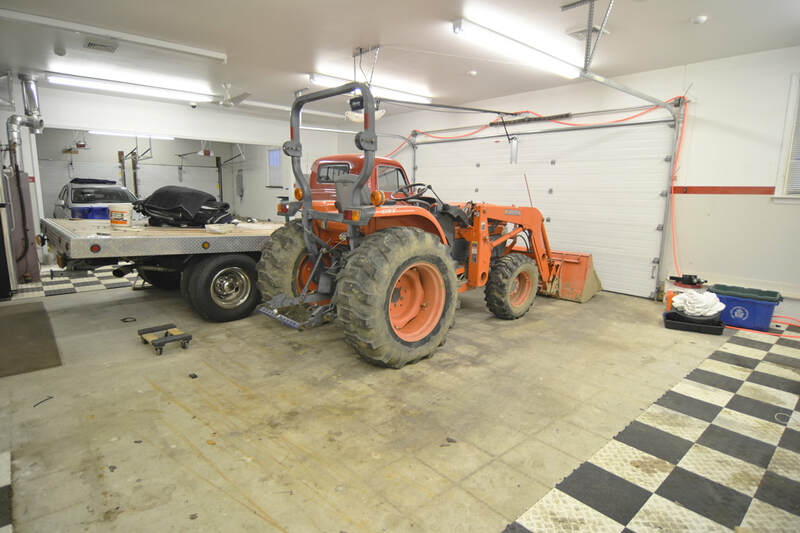 This space has it's own heating zone, it's own oil tank for the furnace, and could be used by today's home-mechanic or car enthusiast to work on his cars. No expense was spared in this garage space. To the left of the hallway when you come in the front door is the rest of the living space. 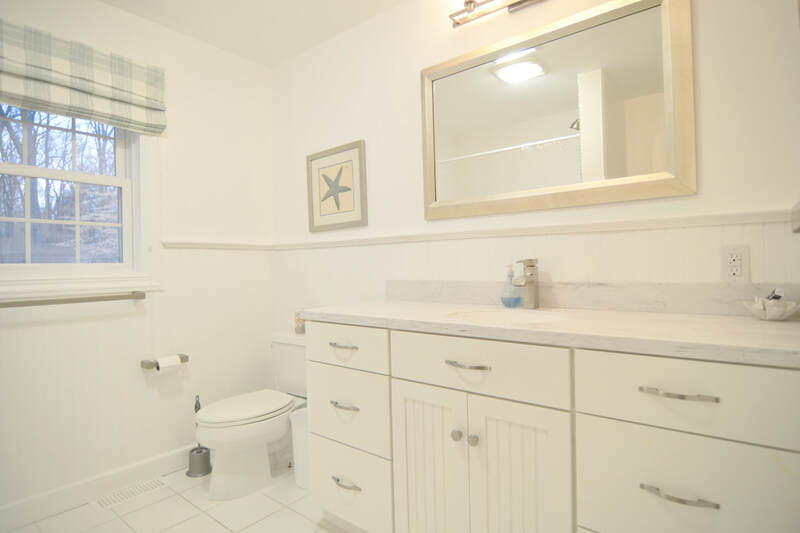 Immediately, there is a full bathroom, completely updated, also within the past few years. It has marble vanity and stonework throughout the bath. The three bedrooms, all with hardwood are here as well - each a good amount of space. The master has an en-suite bathroom that is also newly updated, leaving no work to be completed on this home when moving in. Create a circular driveway in the front that comes up to the front door as is seen in so many million dollar properties in Norwalk. I am sure there are other great ideas for a home with so many excellent features, and at a price that is amazing! 2 Live Oak Road in Norwalk is Cranbury's best-priced listing, and it will go quickly. In a market under $650,000 where there is little out there, this one has so much space, that any buyer will feel at home, and not have to worry about the need to do any work, but can move right in. All of this, set spitting's distance from the Park, but only a mile from Route 7, two miles from I-95, and three miles from the Merritt Parkway - a location worth every cent! Everything a buyer is seeking, in an affordable price range.